Custom Display, a phrase marketing managers will be keen of. They are great ways to increase brand awareness demand attention and stand out from the crowd. Minute maid have taken this to the next level with this magnificent huge custom display on the high street of Harbin. 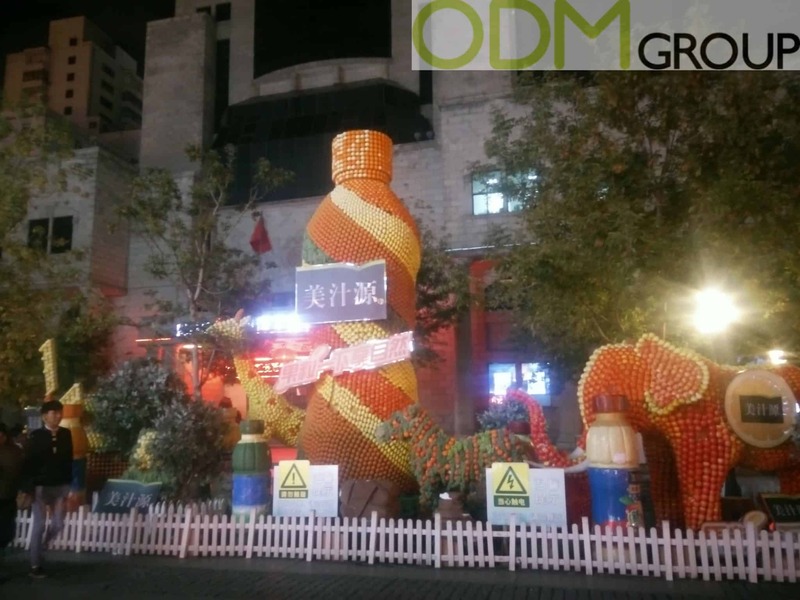 The fruit design of this is in line with the core competencies of the drinks company, conveying the fresh and healthy message of their fruit drinks. The Huge display is bait for photos from potential consumers, given its grandeur people will like taking photos and sharing the images. The benefits of such an awesome display are profound. Not only demanding attention to those nearby, but also creating social media traction, essential for any brand. Brand Activation – This is achieved from a custom display, they are effective because they are unique. This makes them memorable to passers by, targeting the masses or shoppers. All potential customers will see a display like this leading to a sale becoming more likely. Not only is brand activation achieved on premise of display, but when it is a memorable display like this one, Social media presence is positively engaged, shared and activated. Brand Recollection – Alongside brand activation, recollection is achieved from a custom display like this. Due to the fact it dominates the high street, thousands will pass by it, making a memorable addition. Trade marketing managers should consider this in their marketing strategies. Increased Perceived Value – The fruit covering the display is not only in line with the core competencies of minute maid, but it creates a healthy image for the brand. Increasing the value of the drink when compared to others. The fruit makes the drink appear refreshing, healthy and colorful. Increased Profit – These benefits trickle down through all aspects of business. Effective marketing on the front line effects all aspects of a business. When a great campaign is successful, complemented by a custom display the benefits of it combine to ultimately increase growth, profitability and success for a business. Custom Displays are a great way to compliment and improve your marketing campaign. If you are thirsty for more marketing advice, ideas and inspiration you can visit our ODM Blog. With years of experience we can surely offer something of use to your firm. Our POS Display page in particular has great examples of effective displays.